Friday was a much better day in the beginning. We hosted a little Halloween play date at church and played a lot the rest of the day. 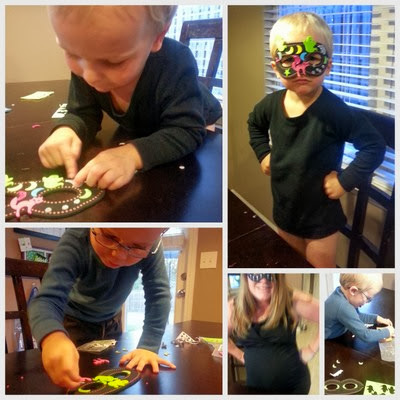 Somehow I didn't even think to take any pictures of the Halloween play date...oops! But the boys had a lot of fun playing with the other kids and the mamas got to talk with each other. It was fun! After lunch and naps, we watched the rest of our Halloween movies from the library and made some more Halloween crafts. The masks were the leftovers from our play date this morning. They already made 2, but needed some more. Just in case. I suppose all superheros need a backup mask for those rough encounters, right? Thankfully, it is Friday. Fridays are one of our favorite days of the week. Why? Because it is pizza-popcorn-movie night!! And, once again, tonight's feature film: "It's the Great Pumpkin, Charlie Brown!" I seriously LOVE that they love that show. But as much fun as we were having...I was starting to not feel all that fantastic. Again. The picture with the mask totally cracks me up.